Alright. I owe you an apology. A big apology. The fact that I haven’t been blogging has been plaguing me for the past month and a half and I just have been too embarrassed to show my slacker face back here at the MotherBlog… which, of course, only made things worse. I am terribly sorry, and I’ll try to be better. Thanks to all those who have reminded me (and shamed me) to come back. Richmond (as well as many other places) was “lucky” enough to get hit with both a 5.8 earthquake and a large hurricane in the span of a week. The earthquake didn’t cause much damage here in Richmond, but then came Irene. This is actually my 3rd hurricane (fun fact, the earthquake was my second) so I grabbed a few gallons of water (in case the water quality was compromised) and a huge bag of apples a jar of peanuts (two of our healthier non–refrigerated items). 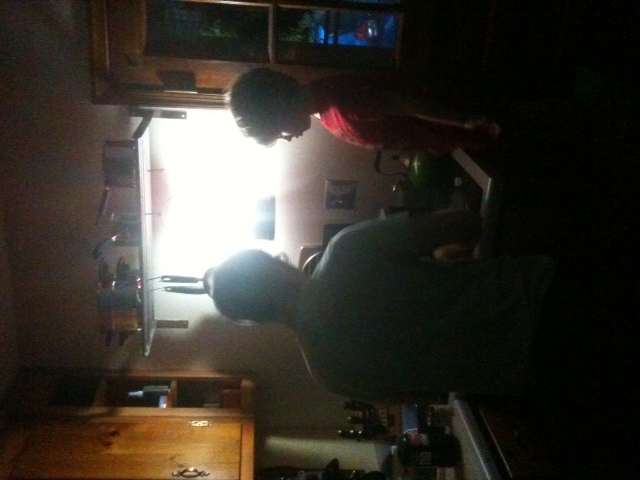 Jeff picked up some flashlights and we grabbed our camping lantern and figured we’d be fine. The only factor that we dreaded was: the kids. We knew we’d probably be fine but we dreaded doing this whole blackout thing with two modern technology obsessed children. 1. I am not as reliant on electricity as I thought. Being the internet & technology loving girl that I am I thought for sure I was going to be bored to death at home without my beloved computer. But in fact, I kind of enjoyed it. I got a lot of reading done and aside from the fact that tv/internet would have been incredibly useful for informational purposes, I really didn’t miss it. 2. Give kids credit, they adapt better than we expect. 3. Lacking electricity is an inconvenience, but really, that’s all it is. We were lucky, there was a lot to clean up, but our house was safe, our family was safe and really… those were the important things. Sunday in the desperate search for coffee and a warm breakfast and in the evenings grilling every single piece of meat you have before it goes bad. This stuff is more fun to do with fun people. 6. On about day 2 I started to see a clear divide between the half-empties and the half-fulls. And I want to take any opportunity to teach my kids to be half-fulls. 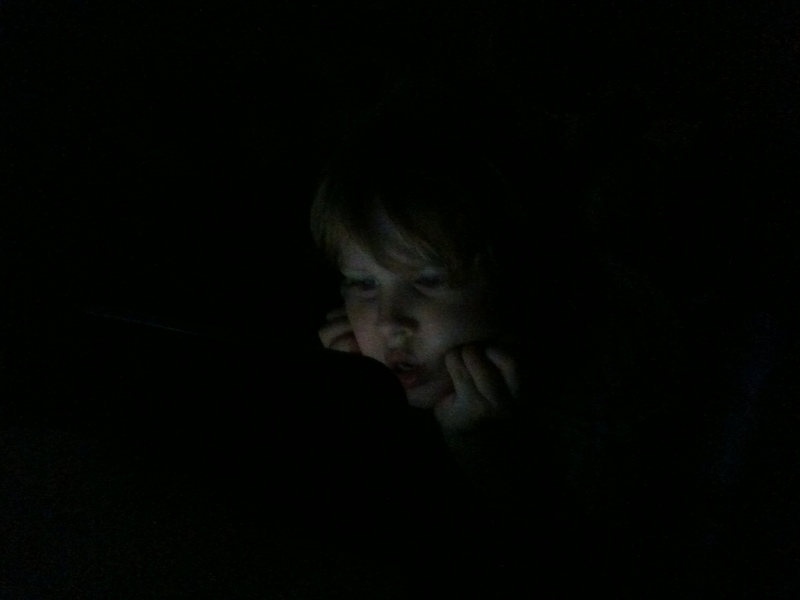 Max watching a movie on day 3 with a dvd player I charged at work. Irene = excuse to drink an americano every morning. Irene- motivation to go to the gym every day… Even if it’s just for a hot shower. Irene = a chance to try out a vegan diet. No fridge needed! Irene = a chance to test out whether or not your kids would like camping. Irene = can’t do laundry, guess I need to get new clothes! Irene = being able to do some of that fancy book readin’ people are always talking about. 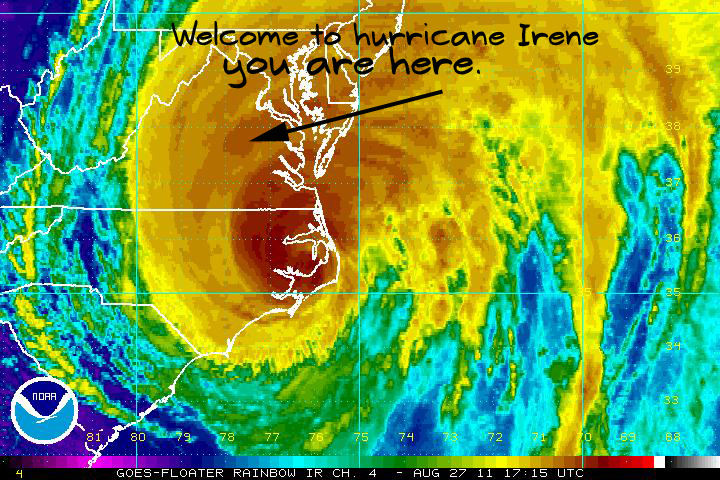 Irene = instant bonding with the people around you over whether you have, or don’t have power. Irene = intimate knowledge of the placement of furniture in your home so you can navigate it in complete darkness. If ever I go blind I’m well prepared. Irene = the only time you’ll ever be super excited just because the living room light flicks on. So, while it wasn’t all awesome, it wasn’t all bad. There was a lot to be learned from the whole experience. I think we had gotten a little lazy around here with too much tv and pizza and Irene helped snap us out of it. The truth is, I think all this technology spoils us, and I hope is that we can learn to value our electronics less and each other more. In fact, that I would like to institute more “black out days” in our house (no tv, no internet, no electronics)… HA! We’ll see how that goes over! Previous post ← When the going gets tough… enjoy the little things.